Thanks for the trust from our valued customers. 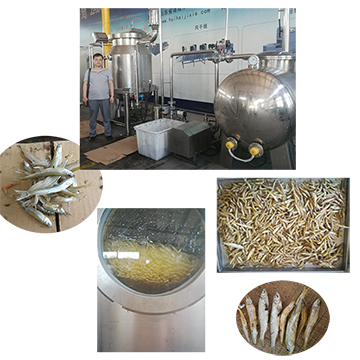 The frying test of the small fishes in vacuum frying machine has been completed successfully now. After the freezing process with quick freezer machine, at vacuum of – 0.095 MPa (absolute pressure 6KPa), frying temperature of 95 degrees and frying time of 35 minutes is determined as the optimal solution. The vacuum Fried fish keeps the perfect shape, not broken, more crispy, and with few oil content.